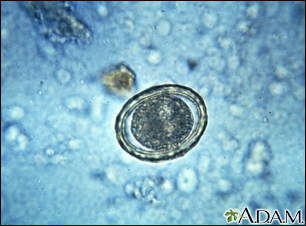 People get ascariasis by consuming food or drink that is contaminated with roundworm eggs. Ascariasis is the most common intestinal worm infection. It is related to poor personal hygiene and poor sanitation. People who live in places where human feces (stool) are used as fertilizer are also at risk for this disease. Once consumed, the eggs hatch and release immature roundworms called larvae inside the small intestine. Within a few days, the larvae move through the bloodstream to the lungs. 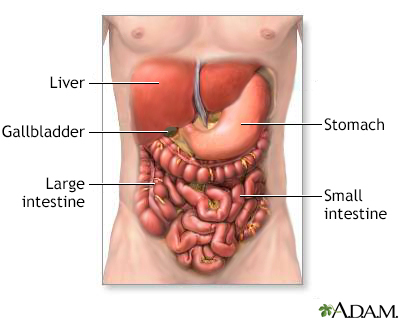 They travel up through the large airways of the lungs, and are swallowed back into the stomach and small intestine. As the larvae move through the lungs they may cause an uncommon form of pneumonia called eosinophilic pneumonia. Eosinophils are a type of white blood cell. Once the larvae are back in the small intestine, they mature into adult roundworms. Adult worms live in the small intestine, where they lay eggs that are present in feces. They can live 10 to 24 months. An estimated 1 billion people are infected worldwide. Ascariasis occurs in people of all ages, though children are affected more severely than adults. Treatment includes medicines such as albendazole that paralyze or kill intestinal parasitic worms. If there is a blockage of the intestine caused by a large number of worms, a procedure called endoscopy may be used to remove the worms. In rare cases, surgery is needed. People who are treated for roundworms should be checked again in 3 months. This involves examining the stools to check for eggs of the worm. If eggs are present, treatment should be given again. Most people recover from symptoms of the infection, even without treatment. But they may continue to carry the worms in their body. If the worms multiply, they can block the intestine. Improved sanitation and hygiene in developing countries will reduce the risk in those areas. In places where ascariasis is common, people may be given deworming medicines as a preventive measure. Bogitsh BJ, Carter CE, Oeltmann TN. Intestinal nematodes. In: Bogitsh BJ, Carter CE, Oeltmann TN, eds. Human Parasitology. 5th ed. Waltham, MA: Elsevier Academic Press; 2019:chap 16. Maguire JH. Intestinal nematodes (roundworms). In: Bennett JE, Dolin R, Blaser MJ, eds. Mandell, Douglas, and Bennett's Principles and Practice of Infectious Diseases, Updated Edition. 8th ed. Philadelphia, PA: Elsevier Saunders; 2015:chap 288.